We have experience in many areas of sport and fitness. If you would like any of our team to come and talk, please give us a ring to discuss your requirements. One of our most popular talks is to young sports teams, parents and managers to discuss early injury prevention, to get players back on the pitch. We give you handy hints and tips to keep players fitter for longer, and to keep you off the sidelines, and on the pitch. Nutritional advice is another of our most popular requests – what to eat, how much and when, with regards to your competition. Our talks can be tailored to suit your needs. Improve your game! Working on a similar format used at many professional sports clubs, we screen players looking for muscle strength, joint problems, posture abnormalities, flexibility, leg length discrepancies etc. Using all the collated information, we can then devise an exercise programme to help prevent any possible injuries, and to increase the attributes you already possess. You can take away your own personalised programme of exercises to work on. We have a vast experience of physiotherapy and sports massage, working with all levels of sportsmen and women- just see our testimonies! We can provide pre and post-event massage for all competitions, or even just as a therapeutic way to ease tension and stress. Our clients include the world famous Cirque Du Doleil, many stars from the entertainment industry who we have worked with at the Motorpoint Arena, as well as several local world champion sports stars (see our testimonies). We can also do full days at your venue if that’s what you require. Many of our distance runners find massage a great way to reduce aches and pains, particularly after a marathon! From assessment, diagnosis and treatment at our clinic in Sheffield Therapy Centre to pitch side physio, we will work with you to try and cure your pain, and get you competing as soon as possible. Our chartered physiotherapists and sports therapists are available to hire for competitions, subject to sufficient notice. Following your diagnosis, we have a number of treatment options to get you on the road to recovery. From acupuncture to mobilisations, soft tissue massage to ultrasound, home exercises to core strengthening, we will use whatever necessary to get you right. We can help with all types of musculoskeletal problems. If you are suffering with a knee injury we have in-house specialist knee physiotherapists to deal with your problem and have experts in dealing with ACL injuries and rehabilitation. Our Gleadless Clinic has a skin piercing licence from the council and we are therefore able to use our acupuncture skills and knowledge to help relieve your pain. We also have access to podiatry bio-mechanical specialists in our Gleadless clinic at Sheffield Therapy Centre, and have great links with the hospitals in the Sheffield area if we feel you need an onward referral. We also offer event physiotherapy packages so if your team has qualified for a tournament or you have a special event and you are looking for a professional approach to a game or tournament, give us a call and we will look to tailor make you a package to suit your needs. We may have worked on the massive Soccer Aid 2010 event with a packed Old Trafford, but we also work on school events and local pub teams etc. 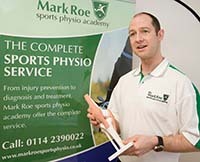 To organise a physio for a competition, or for a clinic appointment, contact us on 0114 2390022. We will be happy to discuss your requirements. At our Hillsborough Arena Clinic we have astro-turf and grass pitches. So if you are not sure whether you will be fit to play at the weekend, why not give us a call? Our physio's can take you on to the pitch and put you through a whole host of rehab exercises like sprints, shuttles, ball-work, plyometrics, etc to see if you are in a position to declare yourself fit to play at the weekend. We can also liase with your manager if you wish to discuss rehab options. Similarly, you may be a manager who would like a player tested before risking him or her in a game. Available in clinic we have now started selling a range of physiotherapy products to complement your injury prevention programme, treatment, home exercises and rehabilitation. The products range from kinesio-tape, foam rollers, shoulder pulley systems, cervical traction units and elasticated exercise bands. Stock is subject to change so please ask at reception when you are next in clinic. Our physiotherapists will be more than happy to offer advice on the best products for you.